I couldn't agree more. Soros, while hardly the only super-rich gent trying to dissolve Christianity into nothingness, is surely one of its highest profile faces. A hideous, diseased face, I might add. 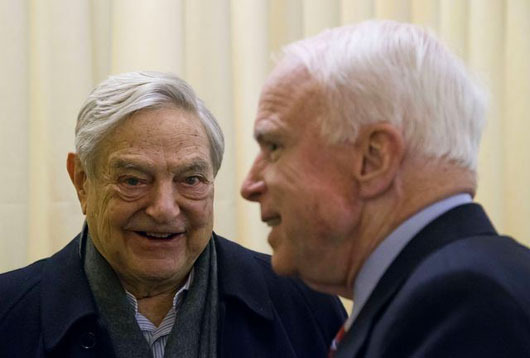 Here is a good article by Dan Lyman at Russia Insider detailing the courageous and true remarks by Hungarian official Andras Aradszki calling out Mr Soros for what he is, an agent of the Evil One. "We see the great European attacks against families, in which Soros and his comrades want to destroy the independence and values of nation states for the purpose of watering down the Christian spirit of Europe ..."
The Hungarian government has established itself as a steadfast opponent of George Soros and the globalist agenda at the political and social levels, but now they have taken the battle spiritual, warning Soros is executing a Satanic scheme to destroy Europe. András Aradszki, Hungary's State Secretary for Energy, delivered a speech to fellow parliamentarians titled, "The Christian duty to fight against the Satan/Soros Plan," in which he warned of an all-out attack on Christianity, traditional values, and the nuclear family. Soros isn't the first Austro-Hungarian of dubious ancestry to be hellbent on destroying Christian European people, his near contemporary, 'Count' Richard Coudenhove-Kalergi also conceived a plan to convert Europe into an Afro-Islamic extension of the Mid-East back in 1923. It is interesting to note that Otto von Habsburg, the famous scion of the Habsburg family, was a key friend and supporter of Kalergi. The question must be asked, why was Otto, Austria's much lauded elder statesman and 'eminent Catholic', rubbing shoulders with the likes of Kalergi. We can only conclude he was on board with 'the program'. Probably some of these old aristo families take a perverse delight in the contemplation of ruling over a degraded population mired in misery and filth. Another Austrian of very dubious background is Karl Djerassi. This 'scientist' is unknown to the general public but well known in medical circles as one of the key researchers instrumental in weaponizing the discoveries of human reproductive endocrinology. He and his associates were liberally funded in the 1950s for the purpose of developing a birth control pill. Deep State jews had decided Christian Europeans were no longer to be herded and fleeced but were to be dispatched straight to the slaughterhouse. And guess what, lots of Vatican functionaries think its a great idea! Thank you, Anon, for that fascinating comment. Indeed Anon...the 'Birth Control Pill', the total destruction of the family and a total demise of any shred of sexual morality in society as a whole, as rightly declared by Paul Vl in his encyclical Humanae Vitae. And....it's a Class A Carcinogen, which has been kept under wraps by the American Medical Society. The Birth Control Pill is probably one of the most toxic drugs, physically, spiritually, and psychologically ever to hit the streets world wide. It's what started the entire sexual revolution back in the 60's and 70's with the help of all the Communist front groups who are still pushing for it's wide distribution and use to this day. These people with George Soros' funding are indeed controlled by Satan himself no doubt about it. The really sickening part about the entire 'movement' is that Soros and boys have even infiltrated the Church of Christ unto the very top. Jesus have Mercy on us!! Spot on, TLM. I shudder to think what the promoters and inventors of the pill will be facing when they face God at their deaths. I became very concerned about Hungary after watching the following video featuring the ever arrogant Netanyahu in Hungary for a state visit with Orban. About 16:00 minutes long. I'll place the link before my thoughts on the matter. 1. Bibi's Zionist-oriented remarks, when one senses a gracious guest would make reference to the honor of his host-nation. 2. Orban's body language throughout bespeaks a great deal of mental discomfort. 3. Orban visibly bows to the arch-terrorist at the end of the event, an indignity which is in no way reciprocated. 4. What went on beforehand? Was Orban threatened with some kind of kill switch diplomacy? Israel's operation Talpiot has had that country getting on the inside of national governments' cyber-security software for decades. Everything the NSA snoops out from us (such as these very words) is old news for Israel, which has managed to surveil the world's biggest (foreign and domestic) surveillance system, from the inside. What happened behind the scenes here? A phone call to Hungary from Tel Aviv? Who knows. Avrahem: Victor, this is Avrahem from Tel Aviv. Just think of me as a concerned citizen of Israel. Thanks for taking my call. We have some demands for you. You will meet every single one. If you don't, our private security firm which has a kill switch on your banking system will shut down every transaction in your country. Here's what that means for the fine citizens of Hungary. No money. No food. After 3 days you will have protests, by day 6 you will have riots. By day 9 your government will collapse. Understand, Victor? Good goy. Oh, and Victor, when President Netanyahu is finished, be sure to bow. We need to see you bow, or we flip the switch. Israel the greatest spy machine of all time. Do you have a source/link for the birth control pill as a Class A carcinogen? Also, which version of the birth control pill (or all of them) is/are Class A carcinogen(s)? I would get on to the LifeSite News website (we have a link to their site on the right-hand column). I am sure that if you search their site you will find the answers you need.